Willie Taggert landed his first commitment as the South Florida Bulls Head Coach just 2 days in to his job. University School (Ft. Lauderdale, FL) Senior QB Michael White. White is 6’4, 195 pounds & considered a pocket-passer… (His ESPN 40-yard dash time is 5.26…) White had scholarship offers from FAMU, E. Kentucky, W. Illinois, & Marshall with other big name schools showing interest. “After claiming the Class 3A state title Saturday in Orlando, the University School football team just can’t stop winning. Suns quarterback Mike White won Florida’s 3A Player of the Year, and coach Roger Harriott earned Coach of the Year honors in the classification. They are each one of eight finalists — one for each class — for the 2012 Florida Dairy Farmers Mr. Football and Coach of the Year awards. The two winners will be announced later this month following a final round of balloting by coaches and media. 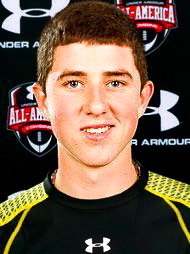 White, a South Florida recruit, completed 178 of 258 passes for 2,176 yards and 22 touchdowns, with two interceptions. He capped the year with 282 yards and two touchdowns in the state final against Madison County.